Good morning from Hamburg and welcome to the last trading week of 2009. We hope you had a wonderful Christmas time and used the holidays a little bit to relax. However, we wish you a successful trading week. The USD/JPY climbed during the Asia session for the first time in four days on speculation that U.S. companies are bringing back earnings on overseas assets before the year ends. The JPY also fell versus all of its other major counterparts as Asian stocks strengthened having a government report said that Japan’s manufactures raised output at the fastest pace in six months in November, damping demand for the JPY as a safe haven. The Japanese Industrial Production climbed to 2.6 percent from 0.5 percent in October. The EUR/GBP rebounded after five days of gaining and declined in the early Tokyo trading hours to 0.8977 at its lowest level as a U.K. report showed that the national home prices rose 0.1 percent from November. The U.K. house prices will decline next year as rising unemployment and concern about the government’s fiscal squeeze limit demand, Hometrack, a London-based research group, said in a statement today. The AUD/USD recovered last week from the lowest level in more than two months as commodities including gold, one of the most important exports, rallied. The AUD/USD touched 0.8880 at the highest level today. 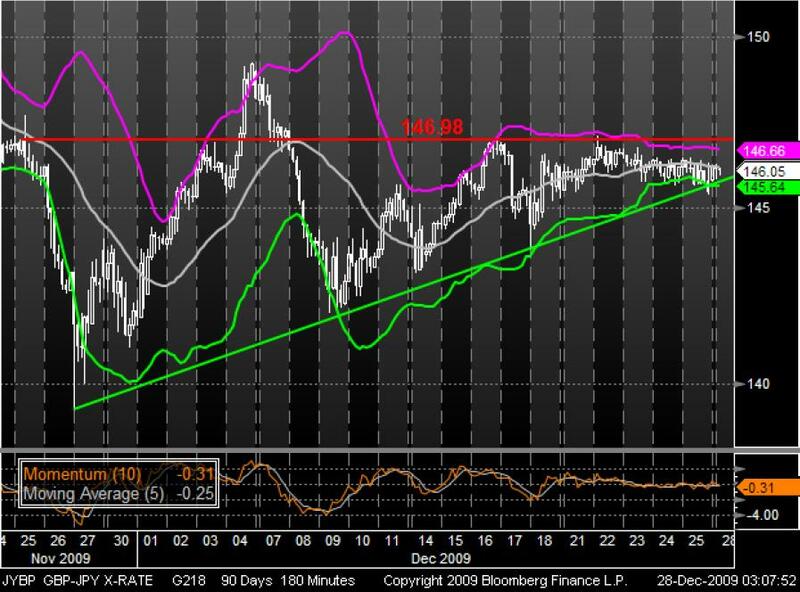 After the GBP failed to climb sustainable above its resistance at 146.98 in December, it seems that the currency pair will test its bullish support-line. In consideration of the contracting Bollinger Bands, which may be an indicator for a trend-reversal soon, and a declining Momentum we may reckon that the currency pair could lost its support and that the bears will lead the rest of the year. 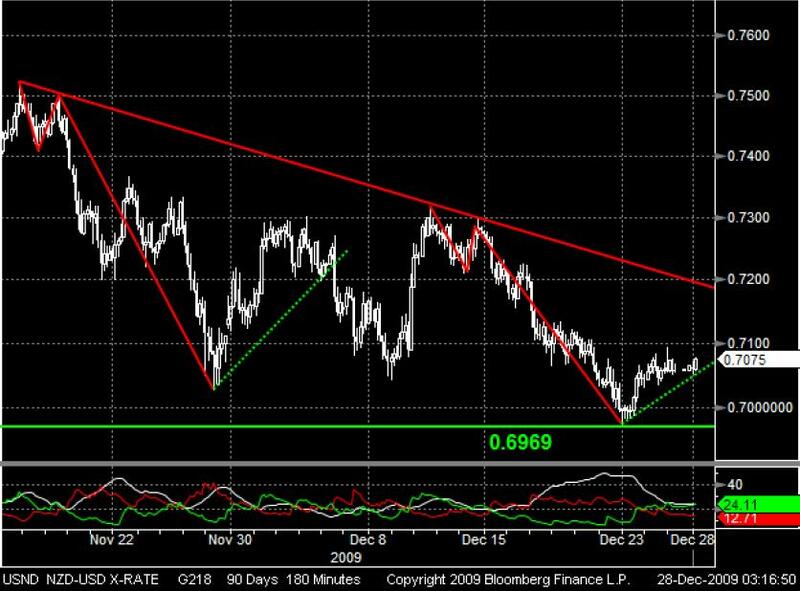 Since November the currency pair has been trading in a bearish environment and fell close to a bearish trend-line near to its longterm support-level at 0.6969. In the next time the NZD may recover up to the resistance line as similar as you can see in the chart-formation in November. On the other hand the DMI indicate that the recovery-phase could end soon and the bears may aim the long-term support again.